Sharing the Scientific Experience with Students Just Got Easier. 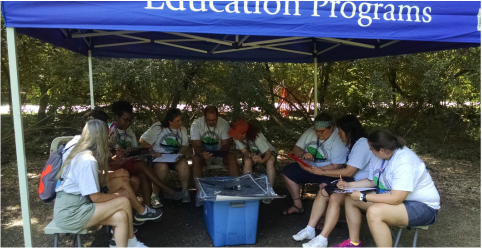 The Lowcountry Algal Monitoring Program for Students, L.A.M.P.S., has been designed to bring an authentic science experience to a variety of audiences with the simple click of a mouse or swipe of a screen- no need to leave the classroom! The Education Department at Patriots Point Naval and Maritime Museum has teamed up with Dr. Erik Sotka of The College of Charleston's Grice Marine Lab to bring the research experience to you, no matter where you are. L.A.M.P.S. enables the participant to become involved in real scientific research in real time with a local laboratory by collecting data from their laptop or handheld device and submitting that information online. That data is immediately available to the laboratory and its scientists. The Sotka Lab has many endeavors. The focus of L.A.M.P.S. is the study of an invasive seaweed, Gracilaria vermiculophylla. Shoreline monitoring of the seaweed (algae) is currently taking place at the Ft. Johnson Marine Complex on James Island. The presence of the algae is being documented with digital photographs. These images are being posted on this site, under "Images and Data Submission", accessible from the L.A.M.P.S. homepage. From these images participants can collect and ultimately submit their findings. To learn more about the algae and field methods, visit "Project Basics" from the L.A.M.P.S. homepage or click here. L.A.M.P.S. data collection lends itself to both group and individual work. While the head scientists would like observations entered into the data submission site to be made by an individual, it doesn't mean group work is out the door. What would L.A.M.P.S. group work look like? If your classroom is 1:1 it is possible every student in a group could be looking at different months, the same month or even the same image on their separate devices. Discussions could range from comparing and contrasting what they are finding to general discussions such as one on methods. When to Fit It In? While some teachers have incorporated L.A.M.P.S. into their class time, others have chosen to make it an out-of-class opportunity. It can be made into a class lesson or an activity during spare time if a student completes their work. For students of any age it is a great project to highlight action and engagement in the community. L.A.M.P.S. fits with a variety of SC State Science and Math Standards, most notably in sections of life science. In areas of both science in math it correlates directly with data analysis including various descriptive statistics and graphing methods. Check out the table below for more information! L.A.M.P.S. fits with a variety of SC State Science and Math Standards, most notably in sections of life science as well as incorporation into genetics and ecology in upper level sciences. In areas of both science in math it correlates directly with data analysis including various statistics and graphing methods. Check out the table below for more information! Probability and Statistics: it can fit into a variety of standards including those found in the interpreting data section. Teachers at Patriots Point's 2016 Teacher Recertification Program learning how to use L.A.M.P.S. We are truly thrilled to bring real data collection opportunities to your class. We are kicking off the school year with a new look and new data collection and submission opportunities. As always we look forward to any feedback. Please do not hesitate to contact us with any questions or concerns. There is much to be excited about and we look forward to working with you!